Happyland Adventures Game Review - Download and Play Free Version! Help the local Happylanders to rid Happyland of evil! Two games in one download. Level editor allows you to make your own adventures. No option to save games. An exciting side-scrolling treasure hunt game! Happyland Adventures is a fun platform game which will allow you to refine your puzzle solving skills. In this game there are many pitfalls which await you. You have to jump over pits of sharp knives and defeat the rebels who want to expel you from the land. This game is a side scrolling action/puzzle game so you will go through multiple levels trying to solve riddles and avoid danger. Find fruit and other treasures to increase bonuses and maximize your scores! One nice feature of this game is there is a level editor which will allow you to expand it to meet your needs. You will see why this game won multiple design awards like best use of SpriteLib. There are evil villians trying to keep Happyland from being happy. With your skills in puzzle solving, you can rid the world of this treachery. An adventure puzzle game which will keep you entertained with a riveting plot and challenging puzzles! Get ready for this surprisingly challenging adventure and recruit all the help you can get in Happyland... you will need it! At first glance Happyland Adventures might seem like a game just for kids, but once you dive in you'll find that even the best gamers will have their skill and patience tested with this good side scrolling puzzle adventure game. 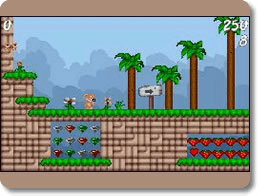 You will have to navigate obstacles, find hidden doors and collect a large variety of items. Two complete games are included in the download to double the fun. The games included are Happyland Adventures and Happyland Adventures: Xmas Edition. Both games are played the exact same way, but the theme is changed and Xmas Edition includes level passwords that can be unlocked. Each level has a main objective of finding a certain number of Happylanders, which are small creatures of various shape and color. You play as a dog who is tasked with returning all the Happylanders safely home. To get them home you run over them and they will follow you, you will then lead them to a safe zone on the level. After you have returned enough Happylanders the level exit will open and you can proceed to the next level. In each level there are extra Happylanders, if you return all of them to the safe zone the enemies in the level will be turned into gold coins which can be collected to unlock a bonus level. In Xmas Edition only there are five magical blue orbs hidden in each level; locating all five will give you the password for that level. Since there is no option to save your game this is very handy for starting where you left off minus your score. The controls are very simple and can be set to any configuration you like. You will need a left and right directional key, a key to interact with the characters that give you information and a jump key. Collecting items in the game can benefit you in several ways. The items such as fruit, packages, ice cream and so on will give you an extra life for every 250 you collect. Hearts act as health one heart will save you from touching a bad guy once. There are also anti gravity boots in certain levels that allow you to jump much higher. The graphics in Happyland Adventures are very similar to Nintendo era graphics. The style is very cartoony and geared towards kids, very similar to the game Island Adventure. Even though the graphics are dated they don't really detract from the game since it is such a simple premise. The sound is okay but it can get repetitive after awhile. The Xmas Edition incorporates some Christmas music to add to the theme. The first game can be very difficult to beat all the way through since you can't save your game and you must start over every time you play. With no option to save you will have to play for as long as you like then start over from the very beginning next time you play. Xmas Edition has level passwords that will let you start from any level you found all the blue spheres on but you will lose your score. Also there are no difficulty settings so you can't adjust how hard or easy the game is. Every game should include difficulty settings to open up to a broader audience. 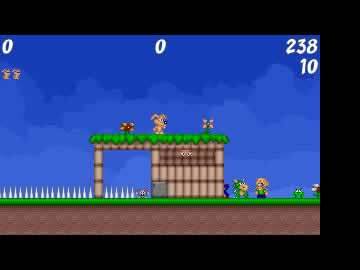 Happyland Adventures is a good game that will take you back to an early gaming style. Even though the graphics are geared towards kids, don't let that fool you, it will still be a challenge for anyone. This game is an all around family friendly game that anyone can enjoy. With two games in one free download you, this will keep you busy for hours.